This oak tree grows in a very old woodland beside my home. The wood is home to a family of old gnarled oak trees some of which date back to the 14th century. The woodland pasture is thought to have been a royal hunting forest in the 12th century, so the trees origins are even older. The roots of these trees have been at home in the earth of Midlothian for a very long time, and they have formed symbiotic relationships with many different types of fungus. The fungi help the oak and the oak helps the fungi, just like a family. The undisturbed soil and roots have merged to form a stable and nourishing base for the huge trunk and canopy of each tree. The canopy, bark and leaves are also home to a vast array of families of insects, birds and mammals. In Dalkeith Park my local oak woodland pasture is home to rare and endangered saproxylic beetles and rare lichen, which are all indicators of ancient woodland. These species have been calling these old oaks home for millennia. In fact oak trees support the most complex and diverse eco system of any known tree, in Britain at least. Sitting beneath these trees always fills me with a deep sense of timelessness, stillness and a sense of belonging. To be in a place for a long time time is to be-long, and to grow a sense of home. Over time we can grow roots into the earth which help to anchor and nourish us, and we can grow fresh leaves as we reach creatively towards the light. The oak leaf itself is the symbol of my beautifully wooded home county of Midlothian, in Scotland. For me all of this makes the oak tree a perfect symbol of home, of nourishment, of shelter and of continuity. To see more takes on home, or to join in the wordpress challenge click the link. This entry was posted in ancient sites, green walks, history, mindfulness, photos, weekly photo challenge and tagged ancient Lothian, mindfulness, nature, oak, photography, postaday, scotland, spiritual, tree. Bookmark the permalink. I wonder how many people have looked up at that wonderful tree, and how many more will do! Amazing to think of the roots so far into the past. Love the tree, and the history it stands for. Lovely blog entry for this week’s challenge. Thank you, happy you enjoyed it 🙂 But what’s not to love about an oak? Beautiful… I love oak trees. Trees really do give a home to so much life, including us I am sure many thousands of years ago. I’ve always wanted a tree house… imagine! That is a magnificent tree! There’s nothing like a sturdy oak for many a creature to call home. Beautiful. Me too, only it was a walnut tree and the branch broke one day and the house came crashing down with me in it. It was surreal. The moment I saw the cat take flight, I heard the cracking of the branch, and then I knew. And down I crashed. Even the memory of it is still surreal. Your image makes this tree look magical – or maybe it really is magical? I love this. When I was little there was an old oak tree at the end of our driveway. I used to lay under it and watch the clouds float by. Trees have always had a special place in my heart. 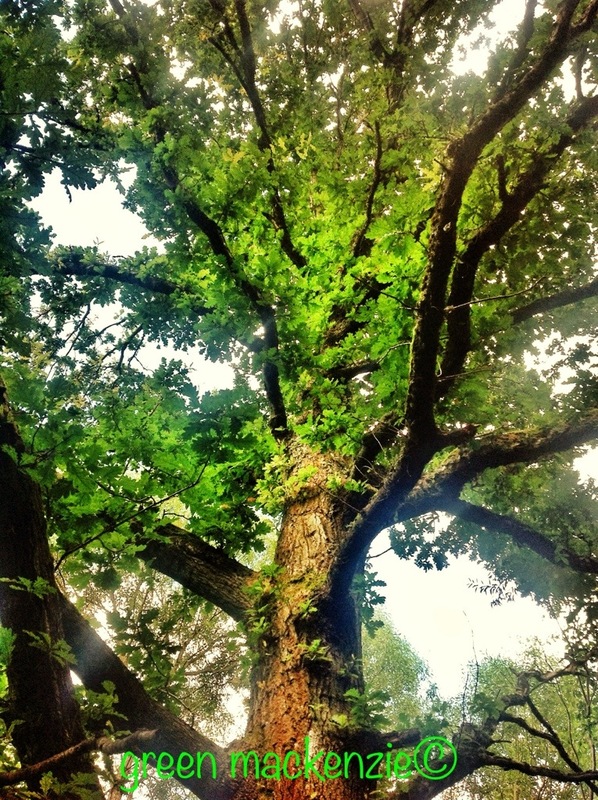 Great post about one of my favourite trees – the oak. Not only because they grow – and age – beautifully but also because of how you describe them here. They are many in the southern part of Sweden, and the landscape Blekinge has the oak tree as their special tree. I really enjoyed this post! A lovely and informative essay.